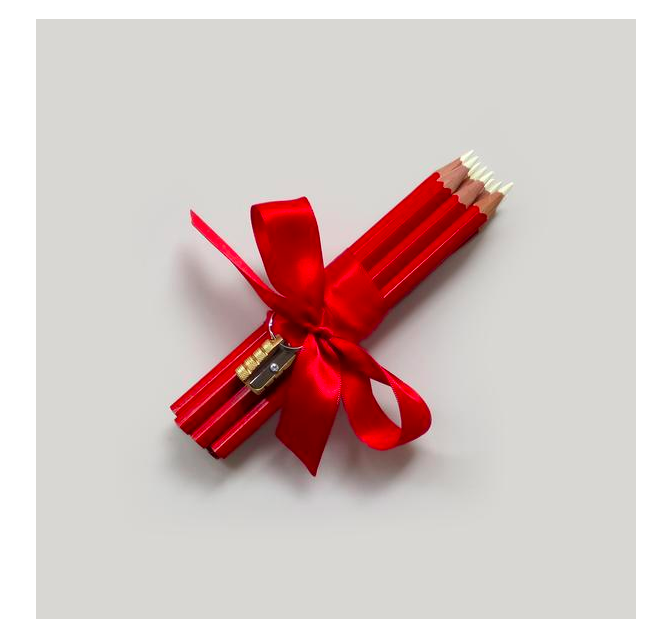 I’ve got pencils on my mind for Valentines. Pencils are a delightful part of everyday life around here with the girls laboring over their handwriting–sharpening beautifully, the erasers all worn down to courageous stubs (furious erasing takes such courage). I am the parent-tutor for a class of six seven-year-olds, we’re together each week for three fun and challenging hours. I will give them each a bright red sharpened pencil and a delicate red pen, the nib type that bends if you push too hard but until then, draws the most perfect fine line. There is just something about red in February. In the evenings the girls and I have been reading Birchbark House, a fictional story about a historic Native American tribe living on Lake Superior. We have landed in the winter chapters. The seven-year-old heroine Omakayas, her sister, mother, and grandmother spend the winter carefully beading projects like moccasins and purses by the dim firelight. My equivalent is slowly beading our photos from 2017 and 2018 into a complete book for each year, purging hundreds of photos from my computer as I go. Last year I forgot to do the book for 2017. I think house hunting took over that computer-use space. Ultimately I have a very limited patience span for computer-ing. If I have one project, the time does not expand to accommodate another. It’s either/or. Since 2013 I’ve used Artifact Uprising for my printed books; lured, I suppose, by their matte printing and rich papers. For years they did not offer an option for any kind of text to accompany the photos, which meant the book actually got done (they offer a text option now, which I will pragmatically ignore). Their online book-building software is better than ever these days, they’ve fixed almost every quirk I used to quietly complain about. I recommend it. I also recommend batching all of your photos into folders by month and uploading the months as individual galleries. There–you have all of my wisdom gained in the last five years. Though I was disappointed to find myself two years behind on the photo books, I have loved working through the photos from 2017. It’s completely wonderous how much has changed in that short amount of time. How much we did. How lovely most of it was. As I edit I often remember to murmur to myself–today we’re as young as we’ll ever be. Bouquet image above from C.W. Pencil Enterprise. This entry was posted in Good design, Other Places Online by Rachael. Bookmark the permalink. Which of their books do you use for your yearly album? Good question! I do their 8×8 square books. And I typically add around 100-120 pages. So my cost is somewhere around $170? It’s a lot, but this is the only photo printing for the family that I do. Bouquets of sharpened (red) pencils… perfection! Rachael, I picked up The Birchbark House from the library after reading this! Always love your book recommendations.Would you recommend it now that you’re a little ways into it? My kids are almost 8 and 5. Some of the reviews said the emotion was too intense — has this been your experience? hi! We loved it. It does have some sad moments, but definitely nothing too “mature” for any audience. A very intriguing and powerful read.